It’s kind of a proven-but-not-really-proven scientific fact that you have to have a tried-and-true classic chocolate mint brownie recipe in your recipe files. These are so classic! Right? I mean, doesn’t everyone love a good chocolate mint brownie? Every time we have to take a treat to a potluck or various gathering, Brian always suggests (and by suggest, I mean, he kind of sort of begs) that we (and by we, I mean I) make these chocolate mint brownies. They are probably his favorite brownie although to be fair, he (and by he, I mean me, too) eats all brownies with gusto. 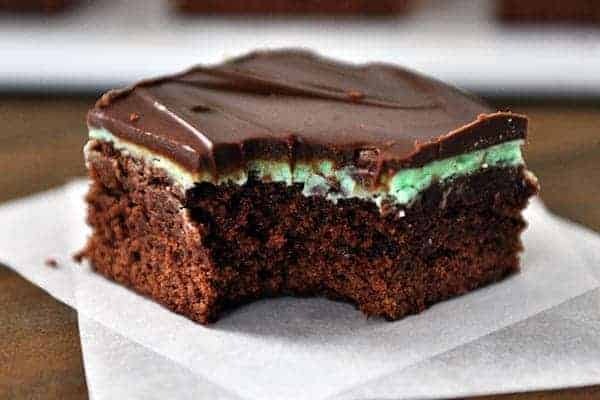 The combination of fudgy chocolate brownies topped with creamy mint frosting and finished off with a decadent layer of ganache is straight yum. I have an old, old, old recipe for similar brownies but they require using a special ingredient (canned chocolate sauce) that I never ever keep on hand. It was high time to get an equally delicious classic chocolate mint brownie recipe on here with every day pantry ingredients. There’s something special about layered brownies (have you tried these magical layered brownies? If not, you probably better; they hold the answers to most of life’s problems). 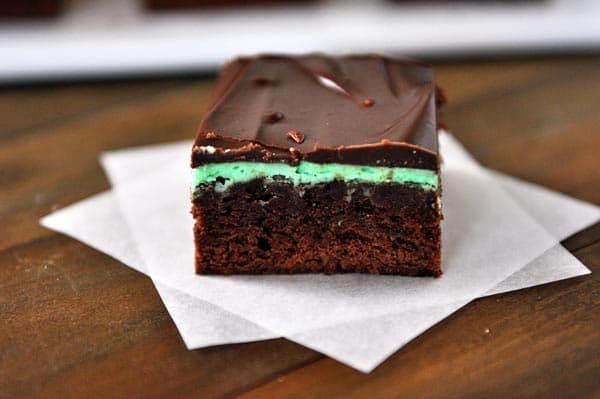 Today’s layered mint brownie version is undeniably awesome. Classic, delicious and best-ever worthy. And just to share one more humble opinion: these taste phenomenal when chilled. In a microwave safe bowl or in a saucepan on the stove, melt the butter. Stir in the cocoa, sugar and honey. Let cool to room temperature. Whisk in the eggs, one at a time. Stir in the flour, baking powder and salt and mix until combined. Spread the batter in the prepared pan and bake for 20-25 minutes. Cool completely in the pan. For the mint layer, whisk together the powdered sugar, butter, milk, mint extract and food coloring (if using) until smooth and creamy. Spread evenly over the top of the cooled brownies. Refrigerate for 15-20 minutes. For the ganache, heat the cream and butter until just barely simmering. Pour over the chocolate chips and stir until smooth and glossy. Stir in the mint extract. Spread the ganache evenly over the mint layer. Refrigerate for an hour or so until the chocolate layer has set. Cut into squares and serve. These taste best chilled in my humble opinion. If you like a lot of mint (and/or frosting), consider doubling the mint layer. I really needed these and I don’t keep cream on hand, so googled to see if there was a substitute for cream in ganache and there is! I just needed to add an extra 2 TBSP of butter to simulate the fattiness of cream and the 2 TBSP for this recipe, so 1/4 cup total to 1/4 cup whole milk and proceed as directed. It made wonderful ganache Now I can’t stop making different versions. I made raspberry butter cream and was surprised how wonderful they are, then made a peanut butter version with milk chocolate ganache. They also freeze wonderfully. Just cut, wrap in plastic wrap and pop in a Ziploc bag. When you want one, take it out and defrost on the counter for an hour or so. Stop me before I weigh 729 lbs! 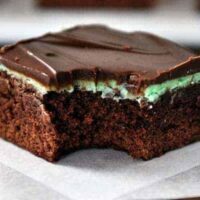 These mint brownies are better than any other brownie recipe I have tried! I will make these again! Happy holidays Mel! First of all, I have been using and loving your recipes for a long time now. (It got me out of a major ‘what am I going to make for dinner’ slump.) You have increased my confidence in my cooking skills because your recipes are so well written and easy to follow. I love how your recipes use things I already have or are at least familiar with. Everything we have tried from your site we have loved! My family is willing to try new food, as long as I got the recipe from you! I refer everybody to your website! So a big “thank you” (from me AND my family) for all your hard work and time you put into your site and for sharing your amazing recipes!!! Thank you so much, Brittany! So, so happy to hear you’ve been enjoying the recipes – love hearing that! As for these brownies, sorry about the mixup! I’ve been changing recipes over to a new format and another mint brownie recipe got copied in by mistake, but I’ve fixed it. Can I substitute essential oil for extract? I have peppermint. Anyone here cook with essential oils? Also, can you suggest a site for cooking with essential oils? Much thanks for any ideas. You could definitely experiment – I don’t know much about that so you might try googling or searching online for some good resources. Is the butter supposed to be melted in the mint layer? We live in Ghana so our ingredient options limit a lot of the “american” recipes we can make at home here. My daughter who usually will only eat ghanaian local food ( she’s ghanaian ) took one look at these and went oh WOW mama lets make those and sure enough we can!! <3 I cannot wait! Love to hear this, Meghan! I’m actually traveling to Ghana in a few weeks – I’m excited to try the local food! I LOVE these brownies. I made 4 batches to give to the teachers and staff at our elementary school for St. Patty’s Day. I’m so grateful I can always count on your recipes! I had the same problem as Angela W. Glass pan at 325 (and my oven tends to run on the hot side) and after 20 minutes, they looked completely raw. Gave them another 5 minutes and then pulled out because the edges were looking too done. Maybe include a detail in the recipe about what they’re supposed to look like when done baking? They ended up a little gooey, but still edible. Not as good as when we’ve tried a BYU copycat recipe before. But, we’ll see if we change our mind once chilled. Lovely brownies ! Easy to follow recipe, a hit in our house. Hi Mel 🙂 I’m having a problem with the baking time for the glass pan version. I cook them at the 325 degrees for 25 min but when I pull them out and do the toothpick test it always comes out very gooey. So I will put them in for another 3 min and it’s still gooey so I put it in another 3 min and it’s still a little gooey but I stop baking them. Should I just always cook them in a 350 degree oven for a glass pan as well? Do you really bake these for only 25 minutes? I have made BYU brownies many times and always have to bake them significantly longer, and my son had the same experience. Strange. Very disappointed with these.. Baked as instructed, they even rose in the oven and when all was said and done with the exception of one inch around the brownies weren’t cooked through.. Mint was overwhelming. I love your recipes but I wouldn’t make this again. Do you think it would be okay to skip the mint layer and make the ganache with mint chocolate chips? I haven’t tried it this way but experimenting is always fun. 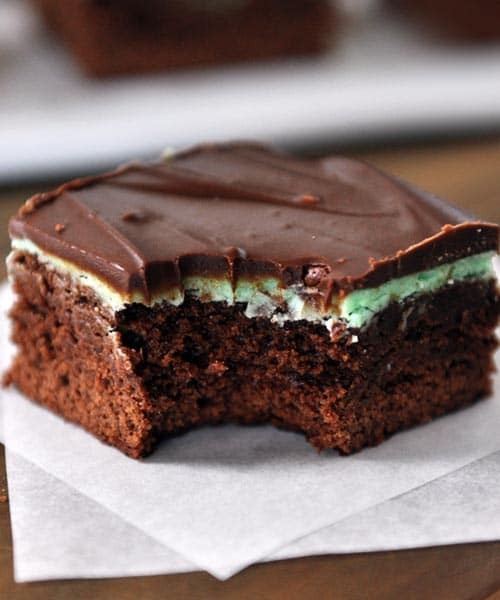 The mint layer gives a softer/frosting-like texture between the brownie and the ganache. Another huge winner! Made and devoured by husband’s work and still getting thank you e-mails. I messed up and made twice the amount of green/mint frosting as forgot I wasn’t doubling recipe- and used it all anyway- just a thicker layer of green and all stayed together perfectly- gorgeous and sooo fab. I made these on the 4th, they are really yummy! They are so much better cold then at room temperature. The mint filling is so yummy, I think I would one and a half it so it’s a little thicker, it was pretty thin and barely spread to a 9 x 13. I LOVE mint brownies. I really liked the ganache on top; it is so easy to spread. I have one recommendation for you. Use PEPPERMINT extract instead of mint extract. Try it and let me know if you like them even better 🙂 Mint extract tastes to similar to toothpaste. These look truly divine!! Can’t wait to try them!! So a few weeks back, I was making the old version on your mint brownie. I was making a double batch to put in the freezer for my missionaries homecoming and farewells. I was on the filling part and opened my cupboard to add the mint and I didn’t have any. It was nearly dinner time and that was behind schedule and I didn’t have time to put it aside until I could get more. What to do? So I looked at my extract options and decided to go with orange. I added a little orange coloring and a few drops at a time of orange to get it right. (I believe it ended up being very similar to the amount of mint.) They ended up tasting very delicious and similar to the chocolate oranges you get at Christmas time. It was such a happy, happy accident that I can’t wait to make them again! Thanks for the updated recipe! Made these tonight. loved them, but I think next time I will double the mint frosting, because I think you can never have enough frosting 🙂 Delicious! Thanks Mel! I want one of those right now! Oh Yum!! Ooh these look fantastic! My husband loves mint – will have to give it a go! And I agree with Elisabeth. If I need a recipe for visiting friends or a very special occasion, I can always trust you, Mel, to give me the best. And I love how you compare the results of using different types of chocolate or butter — your experiments tickle me but they are very helpful. My all-time favorite recipe is the simple cheesy quinoa bites that have become a go-to treat for friends and gatherings. Everyone expects me to bring those yummy little bites to share — and we like them with homemade ranch dipping dressing. Thanks, again, for all you do. Thank you for a beautiful recipe! It is my turn to make dessert for a work potluck and these look perfect!! I want to thank you for your blog!! When I need a recipe that I can count on I always turn to you. I know that whatever you recommend will turn out correctly and I have step-by-step instructions to make it and be confident that it won’t be a waste of time and ingredients. Again, much praise for your inspiration and ability to gently nudge the rest of us into trying things we never would otherwise!! Thanks, Elisabeth – your comment is so kind! I hope you love these brownies if you try them! Those brownies look so good. I would love to make some. But as an empty nester, there aren’t enough people in this house to share them with. I’ll definitely be making some for Christmas, and maybe I’ll find an excuse to make them sooner. I am not much of a brownie eater or maker. But it looks like you are from previous posts. I will tell you that you got me with these mint ones. I love chocolate and mint together. Plus the stripe of green coloring makes it an eye grabber. Ah, BYU mint brownies! These are my hubby’s fav too. We usually make them at Christmas to put them on our cookie plates. So yum! What’s a BYU brownie? Just curious — second time it was mentioned. I suspect it’s a brownie from college days, but thought I’d check. Hi Leslie – thanks for your sweet comment. So kind! A BYU brownie is referring to the famous (and delectable) chocolate mint brownies at Brigham Young University (BYU) where I completed my undergrad. I love mint brownies and make them a lot. I prefer using peppermint extract because I don’t really like the spearmint flavor. Not all extracts are created equal so be sure to use one you like. I made the magical layer brownies recently and they are the bomb. These look great Mel! Love the fresh mint coming through! I just want to reach through and cram that brownie in my face! Oh how I adore chocolate mint brownies. Alas, chocolate does horrible things to sweet baby boy’s tummy. Which means no chocolate for this mommy. Tho I will say sometimes ill open up the bag of chocolate chips and have a good whiff. Hubby thinks I’m a quack! Some men just don’t understand. Totally pinning for that future day when I’m done nursing and chocolate and I have a huge, awesome, reunion party! BYU mint brownies are one of my favorite things in the world – I’m so excited to try this recipe out! Yes, Mel, please do a copycat of the BYU ones that have frosting on top of frosting instead of ganache-yum!! These ones I used to make, um, way too often and got tired of ganache but I will never tire of brownies and frosting! !